I kept reading good things about this movie, and a lot of people called it a hidden gem film. Eventually I decided to get around to it over the holidays, and I found that I quite liked it. There was nothing new about the coming-of-age story that it told, though it was still heartwarming and surprisingly hilarious at times. I had a really great laugh at the botched Monopoly game ending in a police visit – seriously, that is taking Monopoly to the extreme! I thought the cast was very good and they were all well worth watching. Nick Robinson’s Joe was sweet and depressed and strange, with a bizarre outlook on life and a mustache that really needed to be sorted out, and shared fantastic chemistry with Gabriel Basso’s Patrick, a character I somewhat pitied. Imagine having such overbearing parents! I can totally understand the desperation to get away. Moises Arias’s Biaggio cracked me up. It was just so funny to watch him, he was beyond weird. His aversion to authority was hysterical. Nick Offerman was such an unlikeable being as Frank, and you can totally grasp Joe’s frustration with his father. This was a great flick to watch for those boys-will-be-boys moment, and has you thinking of back when you were younger and the crazy and ridiculous shenanigans you would get up to. I mean, I grew up in a farm in South Africa (back when it was safe) and I lived on some stunning islands when I was younger, too, and no matter what, I would find myself exploring daily, building “homes”, being an awesome Indiana Jones adventurer, it was so much fun. There was no such thing as a dull moment or this bizarre notion of watching TV when I was growing up. Watching this got me all nostalgic. I really liked the flow of the movie, it just sort of breezes along, and you feel that you are a part of this adventure the boys are undertaking, or like it is a summer remembered by friends, how it all came together. It’s a nice feeling. 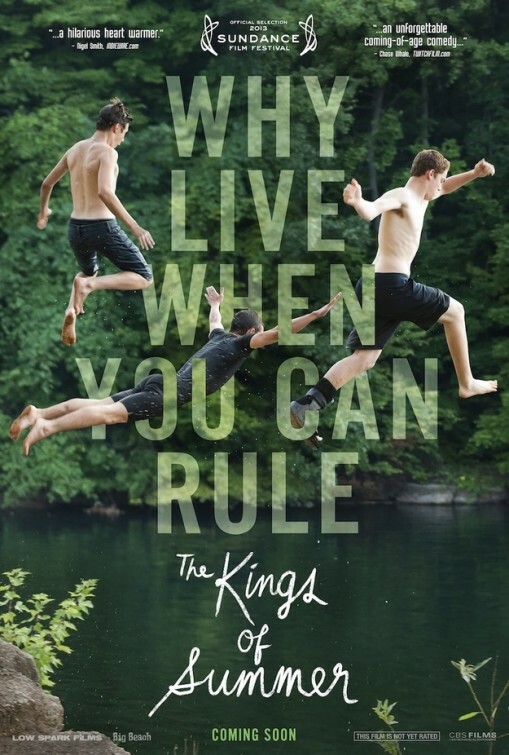 The Kings of Summer was charming and sweet and carried by solid performances from the three leads, and is certainly worth looking into. This entry was posted in Movies and tagged comedy, coming of age, crazy Monopoly game, Gabriel Basso, living in the woods, Moises Arias, movie reviews, movies, Nick Offerman, Nick Robinson, snakes. Bookmark the permalink. Great post! Sounds lovely. Will watch this! I think you will have all sorts of fun with this! Nice one Zoe. I’ve had a copy of this for ages and still not watched it yet. Like you, I’ve heard lots of good things about it. Sounds a bit like Stand By Me. Hey Mark! Thanks. I have read a few people comparing them… I can’t honestly say I have ever seen Stand By Me. I would have to watch it again and see. I do hope that you enjoy this when you get to it! I loved this movie. Biaggio was so funny. He was just the best! Are you EVER coming home??????????? I’ll probably pass on this thing….. I am home now! I know I have been away for an age! Ah, maybe not so much your thing, but it was funny. It’s a nice film that reminds us all why being a kid, especially in the summer, is a pretty great time. Good review Zoe. Damn! Forgot to watch this and got really excited about it at the time. Thanks for the remind Zoe! My pleasure, I hope that you enjoy it! Sounds my kind of films. Especially this! I had a really great laugh at the botched Monopoly game ending in a police visit – seriously, that is taking Monopoly to the extreme! It was so funny! I laughed for a while there! I think you would enjoy it, check it out! 😀 Yes, that be me! Thank you! I have had this on my to-do list forever, glad you liked it. I will definitely have to see it now!